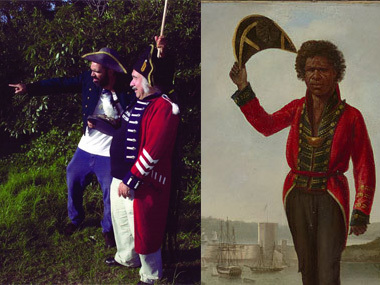 Bungaree, who was famous for greeting ships as they entered Sydney Harbour (Photos: left, courtesy Mosman Art Gallery; right, courtesy NLA). Bungaree was the first Aboriginal to have been called an ‘Australian’. He was given a land grant at Middle Head in Sydney from colonial authorities and was famous for greeting ships as they entered Sydney Harbour. He also joined explorers, including Matthew Flinders, and travelled around Australia. As part of the anniversary of Bungaree as the 'first Australian', the Mosman Art Gallery have brought together 16 contemporary Aboriginal artists to critically re-interpret his fascinating story. The exhibition, currently on and curated by Djon Mundine, features artists Frances Belle-Parker, Mervyn Bishop, Daniel Boyd, Karla Dickens, Fiona Foley, Blak Douglas (aka Adam Hill), Warwick Keen, Gary Lee, Peter McKenzie, Danie Mellor, Caroline Oakley, Rea, Lynette Riley, Gordon Syron, Leanne Tobin and Jason Wing. The Gallery will also be marking the anniversary of his land called, Bungaree's Farm, on 31 January 2015. This exhibition, to be held at the Camouflage Fuel Tanks, Headland Park, will be opened by Mary Darwell, Executive Director, Arts NSW. The artists in this exhibition include Daniel Boyd, Blak Douglas (aka Adam Hill), Karla Dickens, Leah Flanagan, Amala Groom, Warwick Keen, Peter McKenzie, Djon Mundine, Caroline Oakley, Bjorn Stewart, Leanne Tobin and Jason Wing. With a performance work developed in consultation with Andrea James. Bungaree's story will be explored by historian, Dr Keith Vincent Smith, on 24 January if you get the chance. News Categories: Australia | Exhibition | Industry | News | What's on?